Fabulous small drainer. Backstamp: Impressed Ashworth Real Ironstone China, and in script B3194. A little minor surface scratching and on the back there are two small chips to the rim. Overall excellent condition. This drainer is attributed to Barker, Sutton & Till of Sytch Pottery, Burslem active 1832 to 1846, although this design was also produced by their later partnerships, as well as other makers, so attribution cannot be certain. The Royal Cottage depicted is in Windsor Great Park and was largely built and designed for George IV, when he was Prince Regent. It is better known today as a favourite home of the Queen Mother and it is here she died.The pattern re-appeared in the 20th Century, when it was rather oddly renamed Tonquin. No maker's backstamp. The glaze is finely crazed, with a hint of associated staining here and there, which is mainly visible on the back. One tiny nick on rim and on a couple of the holes. All really minor, as drainers do not come much better than this. Wonderful rural scene drainer with kilted gentleman talking to a seated woman and child. No backstamp. Light all over crazing with some discolouration although this is most visible on the back. The surface is remarkably unscathed. Lovely piece. It has a minor light crazing on the back and a little wear around the rim, but the face is in absolutely superb condition. Impressed Bishop and Stonier on the back. Delightful pattern on this drainer printed in a soft subtle blue. No backstamp. It has a small manufacturing chip to the rim which has been glazed over and just a touch of minor wear to the rim but overall superb condition with barely a scratch to the surface. With added colour to the bird and flowers this is a gorgeous drainer. Backstamp: Impressed Brameld Light all over crazing with a little discolouration, mainly around a couple of the holes and on the back. The ochre to the rim is a quite worn, overall a stunning drainer. Onion pattern. This is a fabulous drainer and in superb condition. A couple of the holes do have very minor tiny rubs otherwise all in excellent condition. No backstamp but other pieces in this set had blue printed BWM & C Meissen backstamp, impressed Brown Westhead Moore and impressed registration mark for 1870s. Pretty floral design with Asiatic bird and butterfly, printed in pale blue. 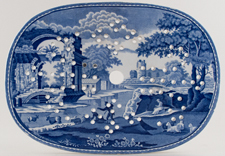 Sometimes known as Lovick's pattern, as previously the only marked pieces had the printed retailers mark "Lovick's China & Glass Emporium, Norwich". This drainer has the impressed mark "S & J B" on reverse, for Samuel & John Burton, Hanley, Staffordshire, active 1832-1845 and is the first piece found with the makers mark. 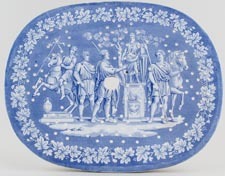 As such it is now recorded by the Friends of Blue and Transferware Collectors Club. Three old rim chips and light crazing. Looks better than it reads! A really pretty drainer printed in a pale blue. Light all over crazing otherwise excellent condition. No makers marks, but this is Syria pattern made by Robert Cochran & Co, Verreville Pottery, Glasgow. Blue printed under the glaze with hand applied enamel colour and enamel rim. Printed and impressed Davenport marks with the impressed date for 1844. Pattern number 72 in Davenport's fine Stone China series, which does not appear to have a name. Delicate gossamer-like printed design with hand painted colour, including two Asian birds, in lovely old tones. Moulding and colour to rim. Few minor nicks to base rim, but in superb condition with hardly any wear or signs of use. A beautiful Stone China drainer by one of the best makers. Printed backstamp of Garter mark with Davenport, Longport, Stafford and inside Stone China and anchor. Pattern number 72 in script. Attractive floral design in light blues on an oval drainer. The glaze is finely crazed with a little light associated staining, but the drainer is in good condition. 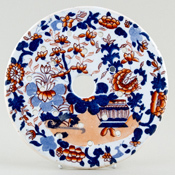 Blue printed floral cartouche with Sunflower and Davenport, impressed anchor and Davenport and date mark for 1844, plus Opaque China. Lovely drainer with large floral detail to the foreground and an Eastern scene in the background, complete with mounted camel. No backstamp. This pattern is recorded as being made by Elkin and Newbon, but it was also made by at least three other makers, so the attribution to Elkin and Newbon is tentative. Light all over crazing with a little minor discolouration and some wear to a little of the rim and small printing blemish to the left of the face. Overall excellent condition. Elkin, Knight & Elkin of The Foley Potteries, Fenton. A drainer in their well known Rock Cartouche Series, which here is a view of Lancaster and includes the castle, St Mary's Church and the town bridge over the River Lune. This drainer is crazed with some associated staining, particularly to the back. There is wear around some of the holes, around the central hole and to some of the rim however all this does not really detract from this lovely piece. A gorgeous drainer printed in a pale blue. No backstamp. A few minor signs of wear, light all over crazing with a discreet hairline of approximately 4" to the right of the drainer and another small one running from the central hole. Also on the back to the rim are a couple of small chips. Oh dear, this sounds absolutely awful but is in fact a wonderful drainer! Stephen Folch, later Stephen Folch & Sons of Stoke on Trent were active 1819 to 1829 and are today renowned for their stone or ironstone china. It was certainly better than Masons and on a par with Spode, with a lovely grey translucency, whilst remaining opaque. 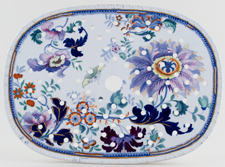 This oriental inspired pattern is illustrated in Godden's Guide to Ironstone on page 243. Printed backstamp of grand pre-1837 Royal Coat of Arms, with Improved Ironstone China beneath. This drainer stands on six feet and has a certain standing. The beautifully shaded colours are a little worn from use and the ochre on the rim is especially worn. There is one small ding on the face and modest utensil marks, but it really is bright and clean and a lovely example of early ironstone from a sought after maker. A most unusual piece. Possibly for inside a muffin dish. Stilt marks have minor roughness otherwise fine. Not marked. An unusual piece, round with a central hole. No backstamp. There is a little discolouration around the hole and a very small manufacturing fault to the rim which has been glazed over, otherwise excellent condition. With gilt. Fabulous drainer printed in a smokey blue with gilt rim and gilt highlights. Backstamp: blue printed mark of a crown over Flanders and pattern number in gilt script 1192, although 2 has long tail. Light crazing with a little wear to the gilt and on the back a hairline of 1¾” which does not go through to the front. With gilt. Fabulous small drainer printed in a smokey blue with gilt rim and gilt highlights. Backstamp: Flanders. There is a little wear to the gilt otherwise excellent condition. Charles Heathcote & Co. A fabulous drainer in this bold pattern. No backstamp. Some surface scratching with loss of glaze to the stilt marks on the face of the drainer and a little wear to the outer edge. On the back a little discolouration but overall excellent condition. With gilt. Fabulous drainer, blue printed with hand painted colour and the rich cobalt blue leaves are highlighted with gilt. Backstamp: Royal Coat of Arms Stone China 51. The gilt to the rim is very worn and on the back there is a chip to the inner rim. There is a little very minor pitting around a few of the holes, overall excellent condition with the face remarkably unscathed. Fabulous large drainer, John Mares Italian. Backstamp: Impressed Mare. Light crazing with a little minor discolouration which is mainly on the back. Also a little wear to the rim, a tiny nick to one of the holes and a tiny tiny one to the rim and small firing fault between two of the holes. This is a gorgeous small round drainer. Backstamp: Mason's Patent Ironstone China. There is a little minor wear on the back and to the outer rim, overall excellent condition. Fabulous drainer with lustre rim. Backstamp: Patent Ironstone China. Some surface scratching with just a little wear to the lustre rim, overall excellent condition. Wonderful drainer with lustre rim. Backstamp: Masons Patent Ironstone China and in script 1621. A little surface scratching and on the back small chips to a couple of the holes and a little minor wear. Overall excellent condition. Gorgeous drainer standing on four small feet, printed mainly in pastel shades of pink, green, blue and yellow. Backstamp: Mason's Patent Ironstone China. Some surface scratching and a little wear to the rim, overall excellent condition. How lovely to find this wonderful pattern on a drainer. Backstamp: Patent Ironstone China. There is some damage to the face of the drainer on the bridge and the hole below that is chipped and still has clay inside. There is also a little damage top right on the edge of the border pattern. Also there is a little surface scratching and minor wear to the outer rim. Sounds much worse than it actually looks! This is a lovely very small drainer. Backstamp: Impressed B and 9 or 6! There is a little minor pitting to some of the holes and a little minor wear to the outer rim, overall excellent condition. This is a lovely drainer in a very attractive floral pattern. Backstamp: Impressed B. Light all over crazing with some discolouration but this is mainly on the back and there is just a little minor wear around a couple of the holes. Overall a fabulous piece. Blue printed under the glaze with hand applied colour enamel. Impressed date code for 1858. Light crazing with a little light staining around a couple of the holes, and also a small firing fault which has absorbed a little stain. Lovely drainer featuring Ripon. No backstamp. Light crazing with some minor associated discolouration, mainly on the back, and a little wear to the outer rim. The stilt marks have absorbed a little stain, and the drainage holes also have some light minor staining around them, mainly on the back, otherwise excellent. Lovely drainer with River Avon scene in this popular series. No backstamp. Crazed with some discolouration although the latter is mainly noticeable around the inner rim and on the back. There is just a little pitting around a couple of holes otherwise the face of the drainer is remarkably unscathed with barely a scratch to the surface. A delightful small drainer. Humphreys Clock is a series of views depicting scenes from Dickens' The Old Curiosity Shop. They are taken from the illustrations in a magazine, in which Dickens' stories were first published. The scene here is Nell and her grandfather travelling by barge up the Warwick to Birmingham canal. No backstamp. Light all over crazing with a little minor discolouration on the back. Overall excellent condition. By John & William Ridgway of Hanley active 1814 to 1830. The Ridgway brothers had a liking for pattern names that began India, rather than Indian. Their India Vase is an unusual, slightly surrealistic design, with a large urn type vase with flowers and one or two large exotic birds, all set against a background of flowing river and falls, with extensive ruin or castle and hills beyond. There appear to be two different views and there may be more in the series. It is printed in a vibrant blue with the clever use of dark and light tones to give a great sense of perspective. No maker's backstamp. Large impressed 14. In places the glaze has pooled a little in manufacture, minor rubbing and wear to rim, a few tiny patches of crazing, although generally the glaze is sound. A charming piece. Fabulous drainer with gorgeous floral detail to the forefront of the pattern. No backstamp. Light all over crazing with a tiny tiny rub to the rim and one or two very minor blemishes. Overall superb. By John Ridgway of Cauldon Works, Shelton, Hanley. 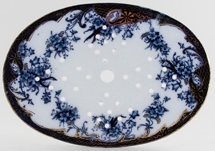 Other pieces in this pattern are recorded with a diamond registration mark for 4 December 1845 registered in the name of John Ridgway for 3 shapes of dinnerware. Small chinoiserie vignettes surround a central floral pattern in hues of teracotta. The drainer stands on four small feet. No backstamp, but pattern number in ochre script 6 over 29 and Ridgway was one of the few factories to get to a 6 series of patterns. Crazed with some discolouration which is minor on the front and heavier on the back. There is a little damage around some of the holes and a couple of very small minor chips to the rim. Overall a lovely drainer. 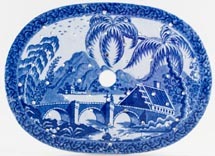 A beautiful drainer with detailed river scene and town and mountains in the background. One of a number of romantic contrived scenes in this series made by John Ridgway. Pomerania lies on the Baltic coast and is famed for its lakes and today is split between Germany and Poland No backstamp. There is a little minor pitting around a couple of the holes and elsewhere a couple of very minor blemishes, overall excellent condition. This is not marked but probably by John and William Ridgway. Unusual in that it stands on four small feet. Blue printed under the glaze with hand applied enamel colour. The rim has signs of wear, some discolouration and also a small firing crack. There is also staining around many of the holes. John and Richard Riley of Burslem, Staffordshire active 1796-1828. A wonderful drainer in this fabulous pattern. There is a a tiny hairline and little minor wear to the top rim with just a touch of discolouration otherwise it is in superb condition. No makers marks. John and Richard Riley of Burslem, Staffordshire active 1796-1828. They took their inspiration from the paintings of Claude Lorraine, an artist born in France, who spent most of his life in Italy. The influence of the Italian landscape is obvious in this view. This is a stunning drainer. There is a little minor light crazing and some wear to the rim. On the back there are two small chips to the underside rim and a little minor staining around the holes. These are all really minor and this is a lovely lovely drainer. A really lovely small drainer, with the piercings being in several different shapes. Backstamp: Tourist W Smith & Co and impressed W S & Co Wedgewood. 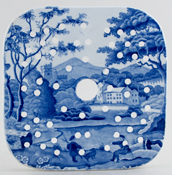 (An injunction was taken out in 1848 preventing the use of Wedgwood on Smiths wares, whatever the spelling). Superb condition. The scene depicts Nuneham Courtenay, Oxfordshire, the seat of the Earl Harcourt, set in grounds laid out by Capability Brown around 1780. Small square drainer with impressed WS on the back for William Smith, Stafford Pottery, Stockton on Tees, Yorkshire. There is some fine crazing to the glaze, with a couple of areas of light associated staining, also minor light staining aroundthe central hole. A charming piece. This is a magnificent drainer, really large, decorated with a later adaptation of Spode's famous Bang-Up pattern, which was introduced in this version in 1823 under the factory pattern number 3504. Blue printed design with hand painted rust red, deep cobalt blue, light blue and much added gilt - really dramatic. Made in Spode's Stone China, it is in fine condition with hardly any signs of use. On the back there is a short hairline or stress crack runnng from one hole, but this does not show on the front, so is very minor. No maker's backstamp (as is common with drainers), but there is 3504 in red script and two worker's symbols. 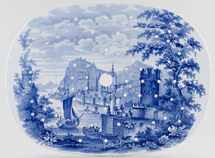 See page 289 of Spode by Leonard Whiter, where a plate in this pattern is illustrated. 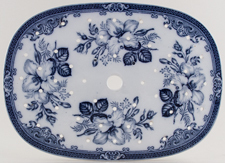 An absolutely fabulous drainer in this lovely chinoiserie pattern. No backstamp. On the back there is a very small chip to the inner rim otherwise in superb condition. Delightful small drainer from a vegetable dish. Backstamp: Copeland Late Spode and impressed crown. There is a little discolouration and minor damage around some of the holes and minor wear to the outer rim otherwise excellent condition. The scene is The Castle of Boudron in the Gulf of Stancio. A fabulous oval drainer. Backstamp: Impressed Spode. Crazed and stained with a little surface scratching and small chips to three of the holes. The scene is The Castle of Boudron in the Gulf of Stancio. A fabulous oval drainer. Backstamp: impressed Spode. There is a chip to the underside rim, not visible from the front, a little surface scratching, a touch of wear around a couple of the holes and a hairline across the lower left hand corner which has discoloured a little. These do not detract however from this lovely piece. 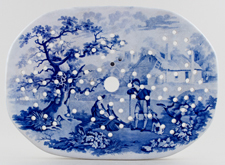 English Sprays was a relatively late introduction by Spode in about 1830 and is found only rarely. This appears to be a slight variant with enhanced blue to the flowers hand painted over the glaze, which creates a slight 3D effect. 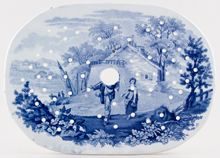 Backstamp: blue printed SPODE and impressed SPODE 1. In blue script the pattern number 5029 over 5. A few lines of crazing to the glaze, mainly around the central hole and a few utensil marks, but in beautiful condition overall. A superb example of this rare design. 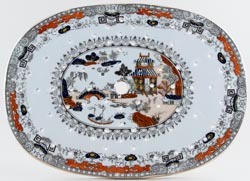 An absolutely fabulous drainer with the central scene surrounded by a wonderful floral and foliage border. Backstamp: rare black printed COPELAND and registration diamond for 14 September 1846. There is a chip to the rim at approximately 2 o'clock and a little minor wear and touch of discolouration otherwise absolutely fine.